Mississippi Voters Reject Personhood Amendment : It's All Politics In the end it wasn't even close. The Mississippi "personhood" amendment on Tuesday's ballot which would have legally defined human life as beginning at the moment of fertilization failed by a very wide margin.Mississippi voters soundly rejected the constitutional amendment, with 58 percent voting "no" and only 41 percent voting "yes." 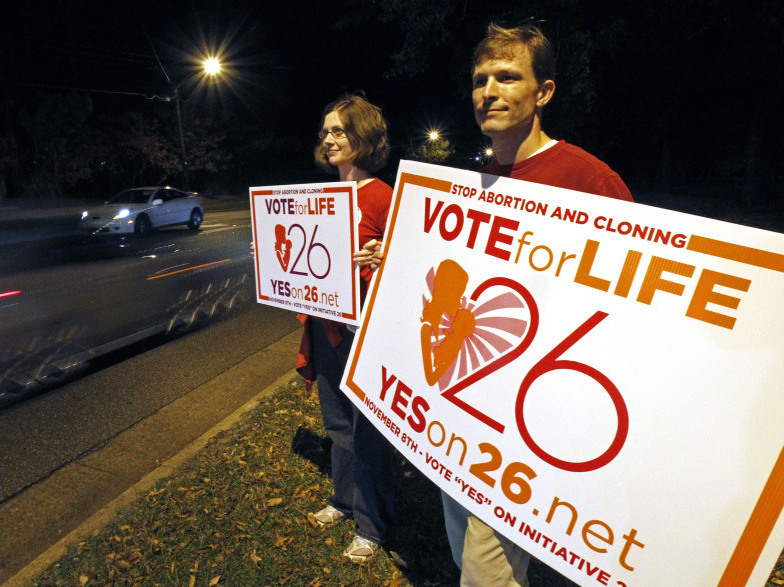 Adam Browne, right and wife Debbie show support for the Mississippi "personhood" amendment,Tuesday, Nov. 8, 2011 in Jackson, Miss. In the end it wasn't even close. The Mississippi "personhood" amendment on Tuesday's ballot which would have legally defined human life as beginning at the moment of fertilization failed and by a very wide margin. Mississippi voters soundly rejected the constitutional amendment, with 58 percent voting "no" and only 41 percent voting "yes." The initiative's failure was seen as a monumental victory for supporters of abortion rights and a signal defeat for anti-Roe forces who seek to overturn the U.S. Supreme Court decision that upheld abortion rights. Considered one of the nation's most conservative states Mississippi, many observers thought, would give the personhood amendment perhaps its best chance for passage anywhere in the U.S. Initially, it looked like the gamble might pay off, with support for the initiative running so strong that passage at one point was virtually taken as a given. But opponents of the proposed personhood amendment waged an aggressive counter campaign that raised all kinds of troubling prospects should the amendment become law. For instance, they warned that the amendment raised the possibility that miscarriages would need to be investigated. Besides abortion, some birth control methods would become illegal, they said. What's more, the personhood amendment threatened to criminalize doctors who provide in vitro fertilization services because many embryos are never successfully implanted but instead eventually destroyed. As NPR's Julie Rovner reported for a Wednesday Morning Edition piece, supporters of so-called personhood amendments have now lost in Colorado as well as Mississippi. ... Felicia Brown Williams is outreach director for Mississippians for Healthy Families, the group that successfully fought the amendment. She said from her group's victory party last night that there was no single reason voters turned against the measure. BROWN WILLIAMS: It was just a matter of making sure that the voters were informed; and when they were they came to our side. JULIE: But this is likely not the last we'll hear from the personhood movement. Efforts are already underway to get similar constitutional amendments on the ballot in another half dozen states next year, and to pass personhood legislation in at least two more.